a) As per DGFT Public Notice No. 10 (RE-2012/2009-2014 )dt. 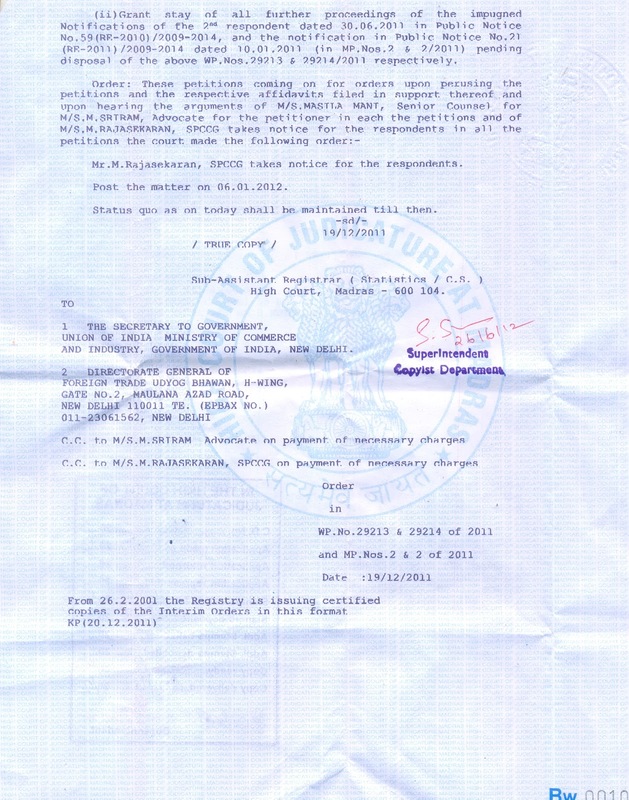 11.7.2012, bar coding on Secondary packing and Primary packing is to be implemented with effect from 1.1.2013 and 1.7.2013 respectively. 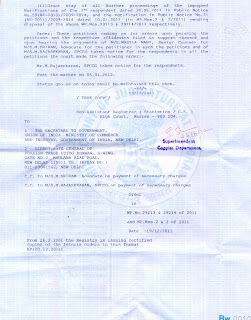 b) However, as industry felt that implementation on secondary and primary packing is difficult and involves huge financial burden on small and big companies, , Indian Drug Manufacturers Association filed a case in the Hon'ble High court at Chennai, some time back , challenging the Public Notice issued by DGFT and the High Court had stayed the Public Notice. 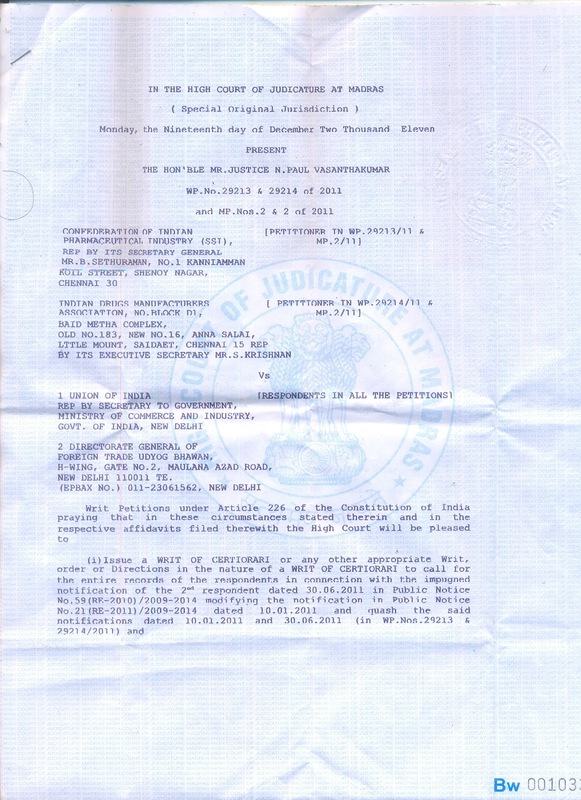 c) When the case was pending before the Hon'ble High Court, recently , Pharmexcil and IDMA met senior officials of Department of Commerce, Government of India and explained the problems in implementation of bar coding on secondary and primary packings. 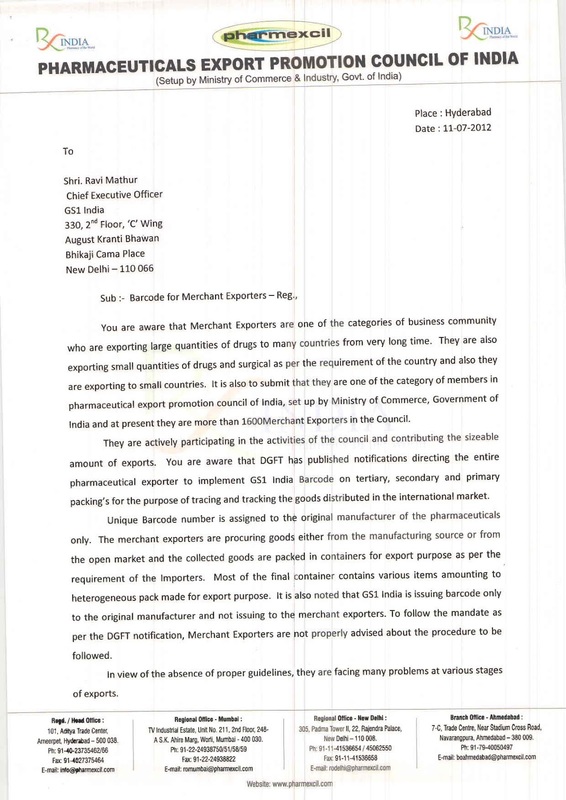 d) While Department of Commerce appreciated the industry's concern, industry was also informed of the challenges / threat faced by Indian pharma due to adverse publicity by vested interests in international markets and it was made clear that Government is determined to implement the bar coding in order to create a brand for Indian Pharma in the international markets as a reliable source of quality Generics. Industry was also suggested to hold discussions with GS1, (the bar coding standards/ service provider) and M/s.Wipro (the software company which conducted a detailed study on technologies/procedures and cost implications involved in the implementation on secondary packing). Accordingly, a meeting of these agencies with CEOs of industry was planned for 24th at Mumbai but the same could not be organized as GS1 and Wipro are not available till 2nd week of Jan 2013. Govt. has indicated that keeping in view the technical difficulties involved in primary packing, further adequate time/extension would be considered favourably. 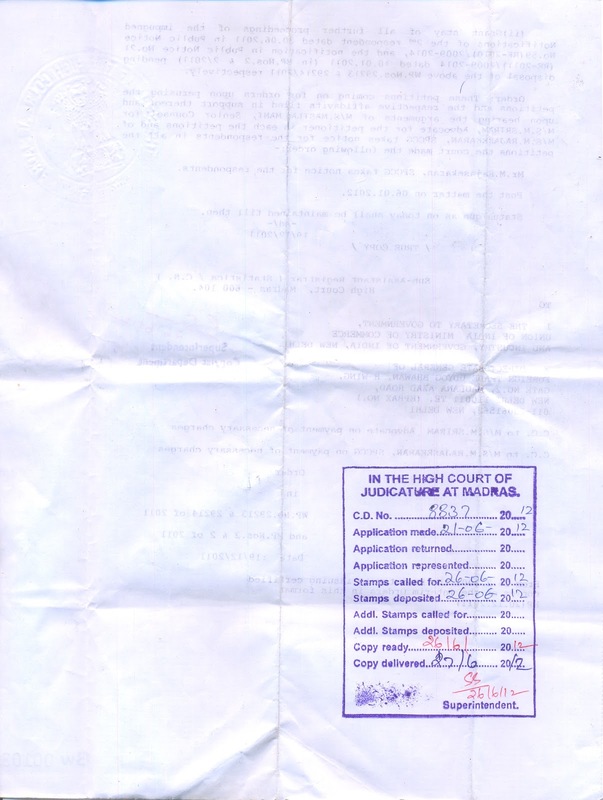 e) Meanwhile, it is understood that on 21st Dec.2012, the Hon'ble High Court of Chennai pronounced the Judgment in the case in favour of Government of India, enabling the Government to proceed with implementation of the Public Notice. 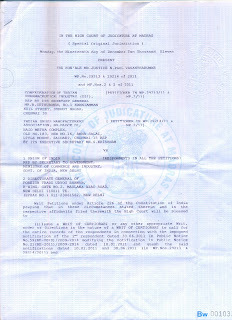 f) As there are only a few days left before the scheduled date for implementing bar coding on Secondary Packing (1.1.2013) and industry is not fully geared up to implement the same, Council had submitted a representation before and also immediately after news of court judgement came to our notice on 21st Dec to the Department of Commerce and requested to give some time for implementation of bar coding on secondary packing. 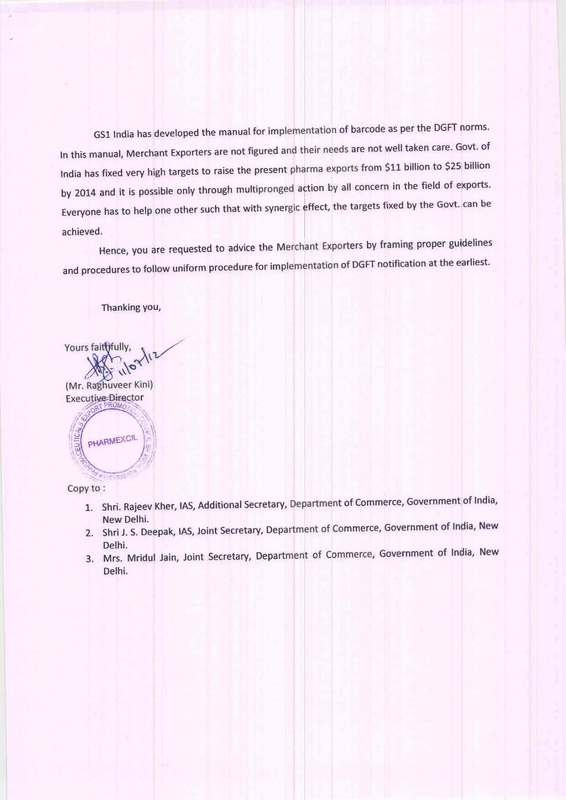 g) Though DoC has always been very supportive and considerative to our requests made for promotion of pharma exports, there are likely delays due to normal year end holidays/leaves. However, council will try its best to get a favourable decision from the Govt. 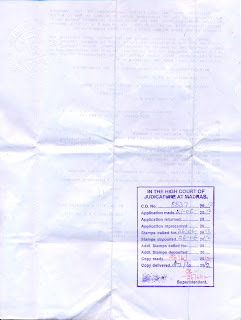 before 31st December 2012, so that exports will not suffer due to this issue. Note: All the Executives are requested to bring this important communication/information to the notice of their CEO/Managing Director. We hope the above information is clear to the members. Members may contact us at rd@pharmexcil.com / dg@pharmexcil.com or 040-23735462 for any further clarifications.